I am so excited to be here today with my very first post for Stix2! I was so excited and honoured to be chosen for their very first Design Team. I hope that you will follow along with the tutorials that I (and other DT Members) will share every month – I hope to show you some techniques and ideas for making the most out of your Stix2 products. 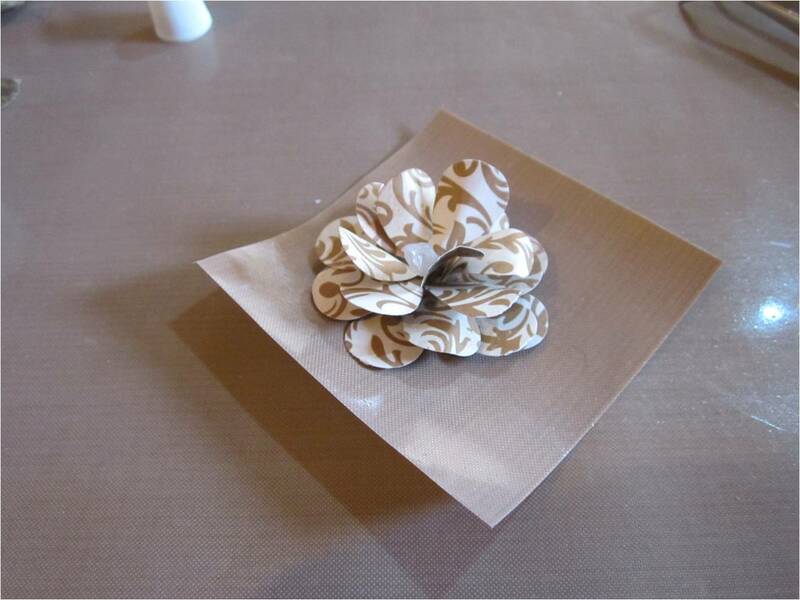 When I received my first DT Pack I knew immediately that I wanted to show you some really cool flowers that can be made with the Silicone Adhesive and the Non Stick Crafting Sheet, but before I start with todays tutorial I need to talk with you about my Crafting Sheet. I am so impressed with the quality and thickness of the Non Stick Crafting Sheet – I have had some other sheets and am sad to say they were certainly lacking in quality and just didn’t work as well. When I laid my Crafting Sheet onto my desk I realised that it was a little on the big size not only for my desk but also for the size of the projects I would be completing on it – the desk I work on is purposely quite small – I like to have a neat space and having a small desk helps me keep it so. With that in mind I decided to cut 3 inches from the longer side leaving me a sheet measuring 15″ X 15″. The piece that I cut off I then cross-cut into 3″ squares which are perfect for small embellishment making and things that need a lot of time to dry. Now I know to some of you that may seem like sacrilege but we must do what works for ourselves!!! Step 1: Lay out your Non Stick Crafting Sheet on your work surface. Using the large punch, punch out 5 or 6 large flower shapes and 1 medium flower shape. 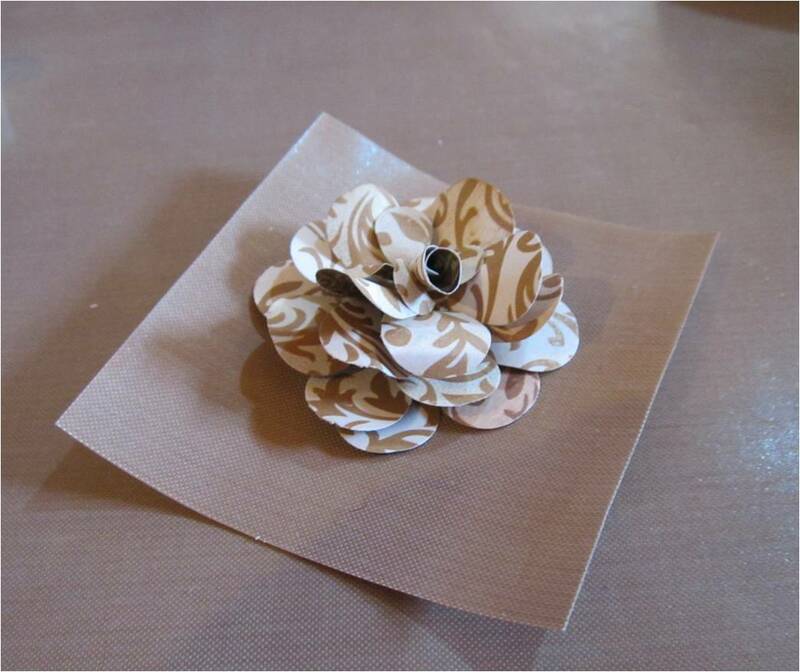 Set the medium flower shape aside and cut the large flower punch-outs into single petals. 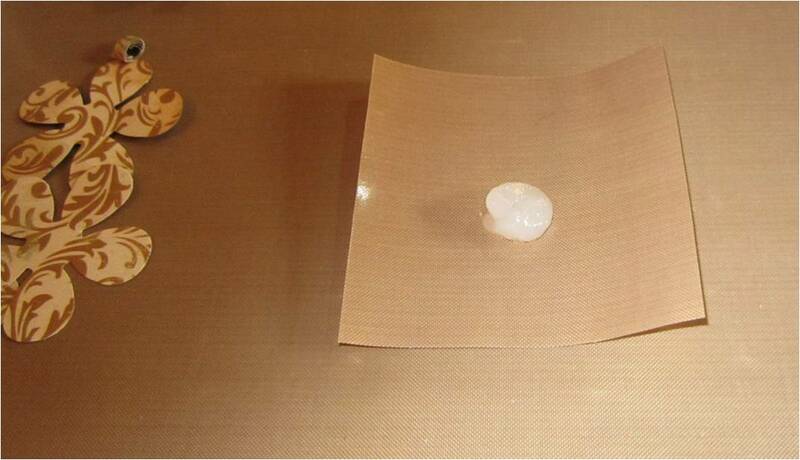 Step 2: Squeeze some Silicone Adhesive onto your Crafting Sheet in a circular shape about the size of a 10 cent coin (for this project I have chosen to use the Silicone Adhesive without the included nozzle). 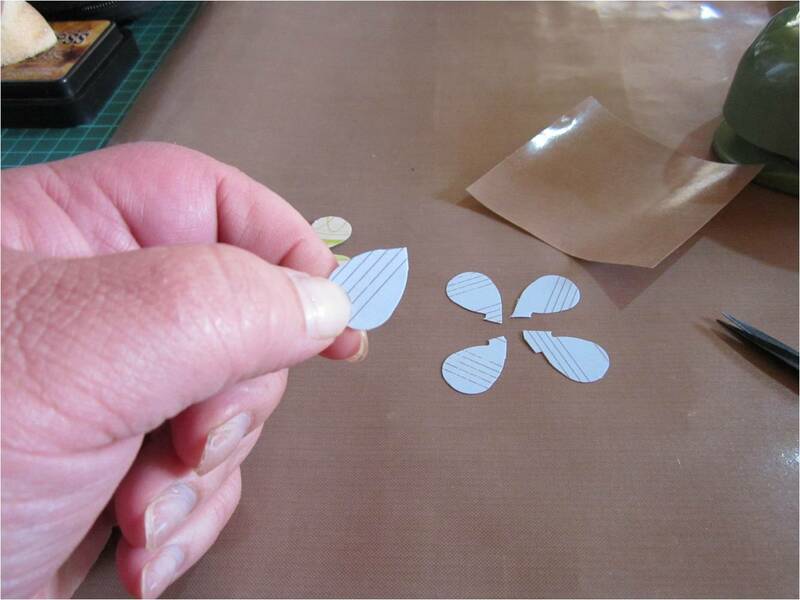 Step 3: Place petals in a spiral shape into the Silicone Adhesive – you may like to shape the petals with your fingers before setting in place. Step 4: Continue adding petals to the flower, shaping as you go, As the silicone will be firm once dried you can add height to the flower knowing it will be held securely in the silicone. 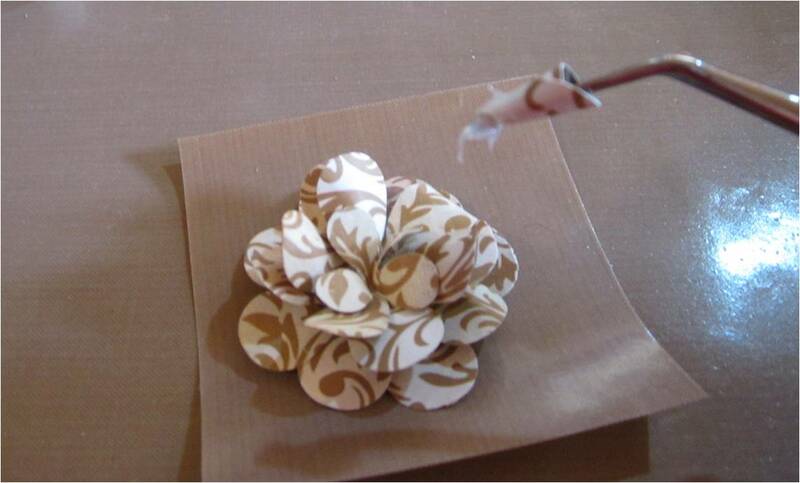 Step 5: Once you are satisfied with your flower, take the medium flower punch-out and cut 1 petal from it. 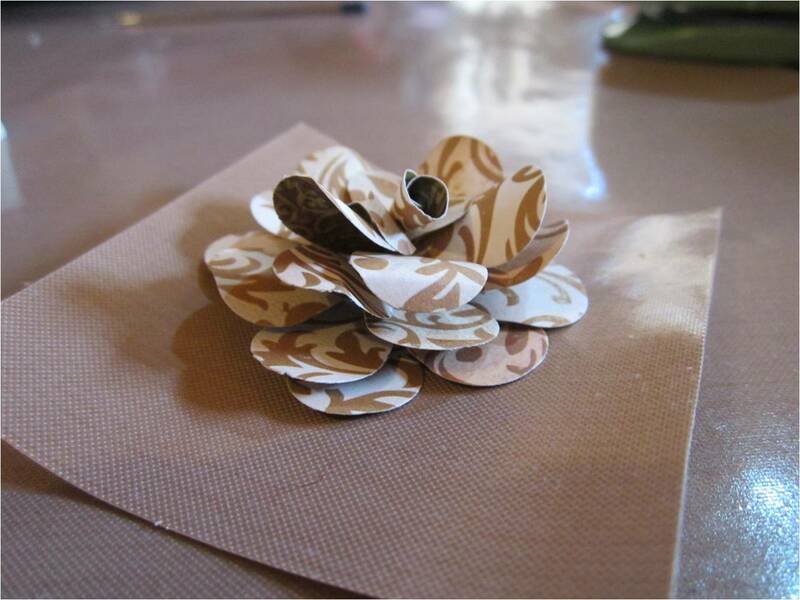 Fold the petals of the punch-out together and then position in the centre of the flower – this will hide any silicone which is still visible. Step 6: Finally roll up one of the remaining petals, add some silicone to the end of it and position in the centre of your flower. The flower is now complete! 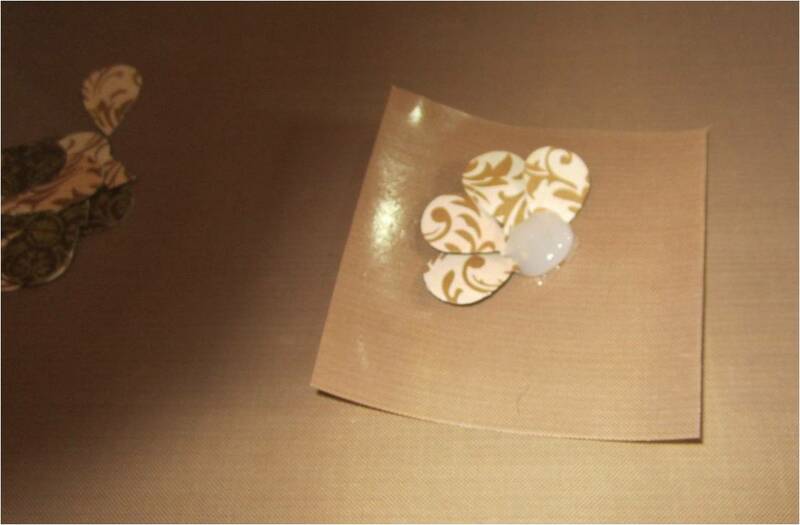 While the silicone adhesive is still wet you can play with the petals so they will sit where you would like them to. Once you are happy with your flower, set it aside to dry. Depending on the temperature and humidity this could take 2 -6 hours and will be fully cured in 12 hours. In Melbourne on an 18 degree day it took 3 hours to dry. 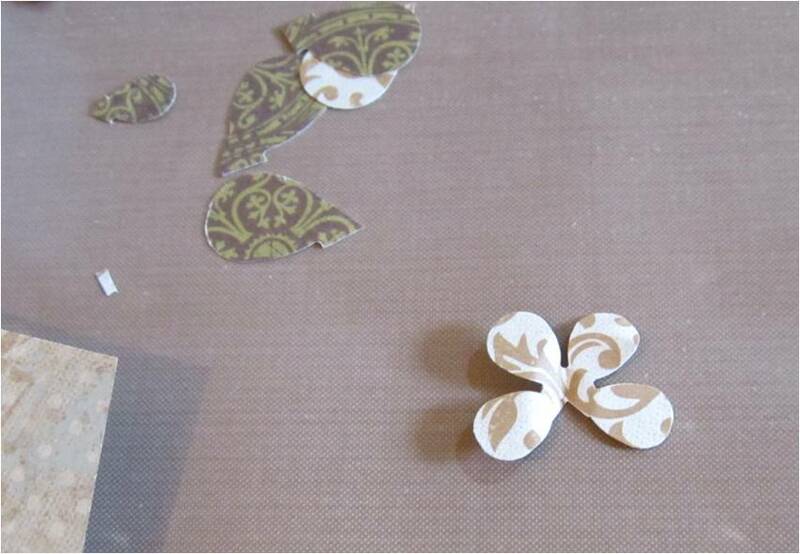 Once dry you can remove the flower from the crafting sheet and place it on your project. You will notice that there is no residue left on the Crafting Sheet – it really is non stick!!! 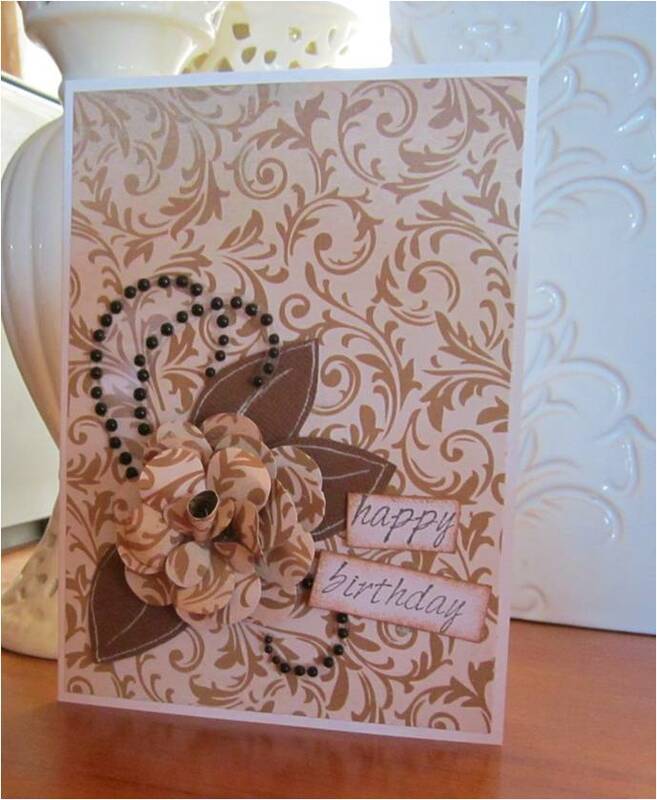 Here is a photo of my finished card – I think the flower has turned out pretty fab, even if I do so say myself! I hope you have enjoyed my first tutorial – it would be great if you could leave a comment below letting me know your thoughts! You can find the Stix2 Silicone Adhesive in store HERE and the Non Stick Crafting Sheet in store HERE. 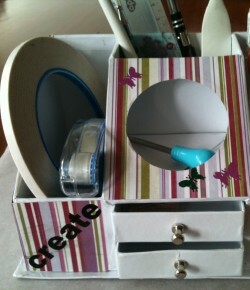 Enjoy your weekend – hope you get crafty! Well as we said from the beginning, our Blog was all about the ‘Journey’ of Stix2 Anything and how we wanted to share the growth and success of our development with our readers and customers. As part of this, we have been working behind the scenes to work on ways to capture the attention of Bloggers and Crafters. So after hours of chatting and social media interaction, we have started to build our very own Design Team! So within the next few weeks you will see projects completed from our Designers which will demonstrate a variety of products and techniques alongwith showcasing our very own Stix2 Anything products. The Designers we have chosen have many years of experience and all started off like us – NOVICES but continued along their path to find new ways to explore their creativity. 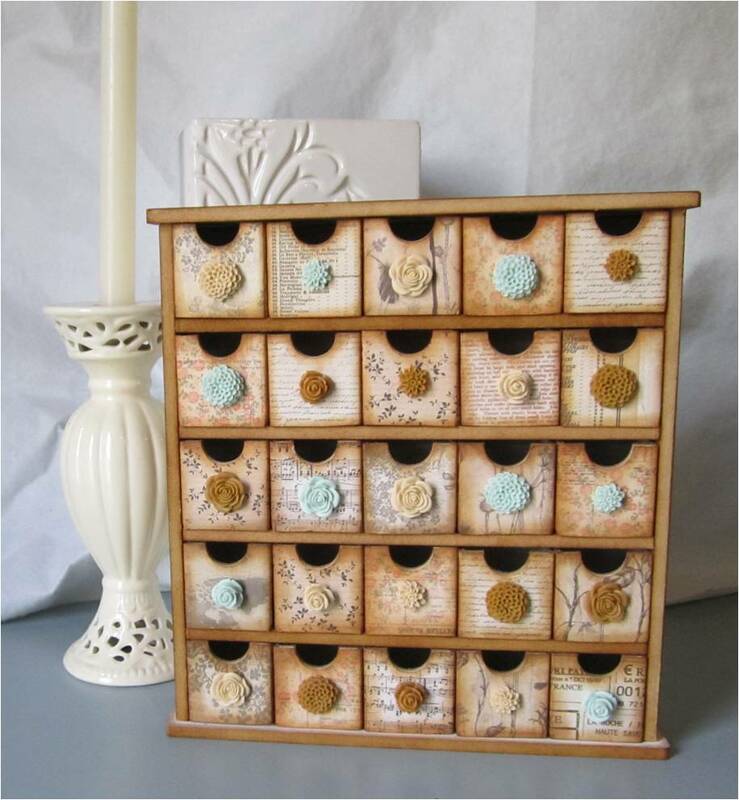 Now you may not always find the most ‘Amazing WOW Factor’ projects being uploaded, but don’t be disappointed as we have sort Designers who can sometimes ‘look outside the square’ and use bits n pieces to demonstrate how to produce the easiest embellishments and designs without eating into your budget. Katherine Prefol from Melbourne, Victoria. 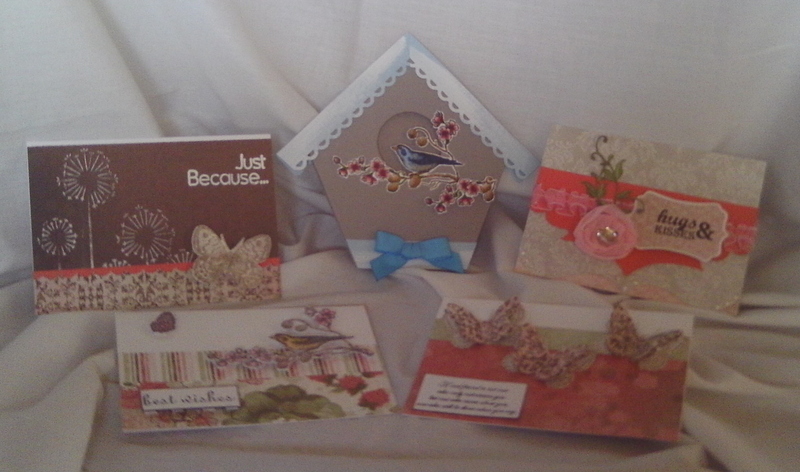 Katherine’s work has been published in Australian Cardmaking, Stamping and Papercraft Magazine and she has had several projects published in the Kaszazz Catalogue and on their website. 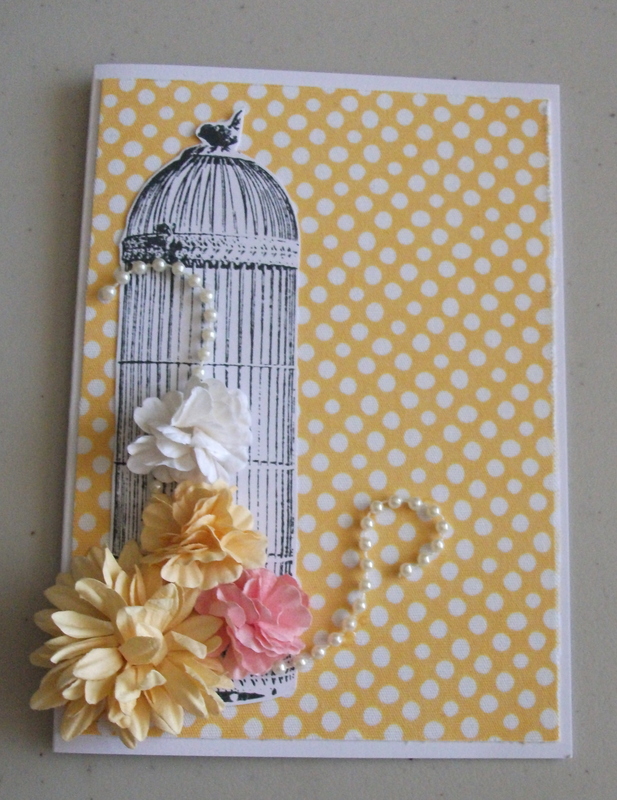 In November 2011 her work, a commissioned tutorial, was published in Issue 90 of Scrapbook Creations. In December 2011 Katherine produced some design work for Grant Studios which was displayed on their booth at CHA Winter 2012. 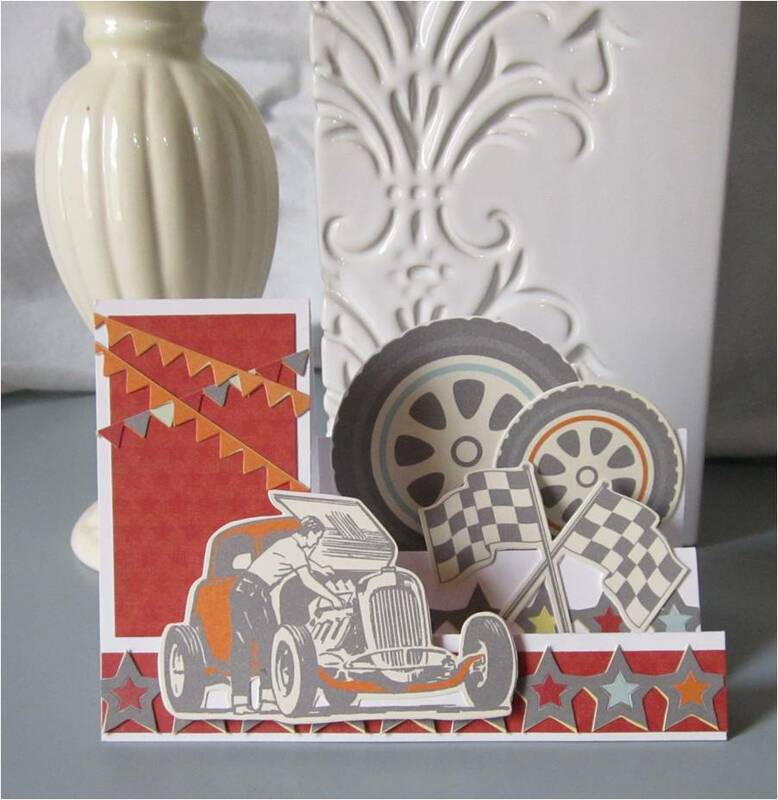 Katherine has also done some design team work for Scrappit, Sawyers Place and Scrappers Delight. We are so delighted to have Katherine join us and can’t wait to see what ‘specials’ she has in store for us!